The Offer edit section is where the magic happens! Here you'll be able to select from 8 types of offers to provide a myriad of discounting options to your customers. Each option in this list will open up the configuration options. In this article, you'll find a description of each offer and how to configure it in your store. Click on the link below to be taken to the instructions for that offer type. There are three main configuration options to set up a BOGO offer. The first two labelled, Trigger and Offer, control the X and Y of the BOGO offer are detailed below. Trigger: This is the criteria that determine if the offer will be activated. You can set the quantity of how many products will be needed to meet the offer. You can choose both individual products, multiple products, individual collections, multiple collections, or a mix of each. Offer: After the trigger criteria is met, the offer portion of the BOGO will activate. Similar to the trigger, you can select both individual products, multiple products, individual collections, multiple collections, or a mix of each. After the products or collections for the trigger and offer have is set, you’ll need to choose a type of discount that you’d like to offer: Exact Price, Subtract Price and % off. Exact Price: This discount allows you to set an exact price for the offer portion. For example, Buy 3 of product X, and receive 2 of product Y for $5. Subtract Price: This discount allows you to subtract a specific amount from the offer portion. For example, Buy ten from collection A, and receive 1 of product Y for $5 off. % Off: This discount allows you to discount a percentage from the offer portion. For example, Buy 1 of product X, and receive 2 of product Y at 50% off. Buy 3 of product X and receive 1 of product Y at 50% off. Buy 1 of product X and receive 5 of product Y at $10 off. Buy ten from collection X and receive 15 from collection Y at 100% off. Buy one from collection X and receive 2 of product Y at $1.50. The message section is where you’ll set how the notifications appear on your store. There are three main stages to the BOGO offer messages, initial message, progress message and success message. Keep reading below our GIF for more details. The initial message is what your customers will first see when viewing a product or collection that is attached to your BOGO offer. Appearing, unless customized, at the top of the page, the initial message informs your customers if the product or collection they’re viewing has any offers attached. Buy 5 X product and get product Y at 50% off! The progress message is what your customers will see after adding the trigger portion of the BOGO offer to their cart. Depending on how the offer is set up, the progress message can be visible on the collection, product and cart page. 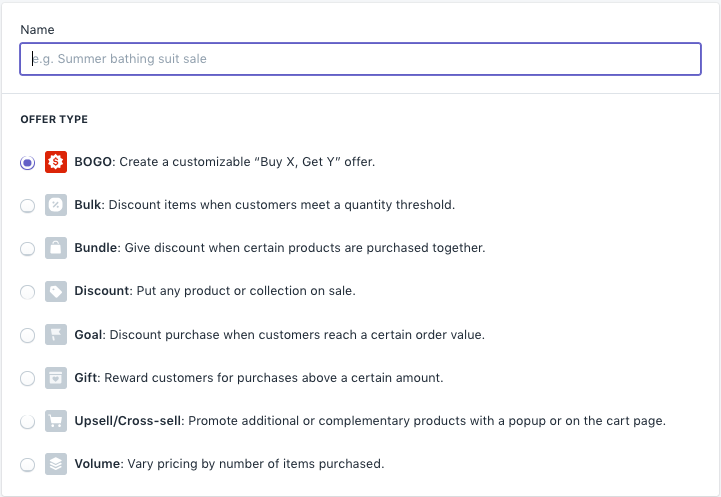 For example, if your customer buys 3 of product X, but the trigger requires 5 of product X, instead of continuing to the success message, the customer will have an updated progress message stating that two more of product X is required to meet the offer. Buy 5 more of product X and receive 15 product Y at 90% off! Congratulations, you now qualify to receive collection Y for $30! The success message is the third notification your customers will see. After your customer completes the criteria for the BOGO by adding the products to their cart, they’ll be presented with the success message. There are three main configuration options to set up a Bulk offer. The first two (Choose Item and Choose Discount) control the product selection and discount type of the Bulk offer. - Choose Collection which will popup a window allowing you to select entire collections. You can also select all your active collections by clicking the "Select All Collections" button. Choose Discount: After the products or collections for the Choose Item is set, you’ll need to choose a type of discount that you’d like to offer: Exact Price, Subtract Price and % off. Buy X of product Y at 50% off. Buy X of product Y at $10 off. Buy X from collection Y at 100% off. Buy X from collection Y at $1.50. The message section is where you’ll set how the notifications appear on your store. There are three main stages to the BOGO offer messages: initial message, progress message and success message. Buy X product at 50% off! The progress message is what your customers will see after adding the product or collection you've selected to their cart, or are viewing the product or collection. Buy X more of product X and receive 90% off! Buy X more from collection Y and receive $30 off your order! The success message is the third notification your customers will see. After your customer completes the criteria for the Bulk offer by adding the products to their cart, they’ll be presented with the success message. Thanks for buying from the X collection, you now qualify for $5 off your purchase! You've bought from the X collection, a 20% discount has been added to your cart! There are three main configuration options to set up a Bundle offer. The first two (Bundle Item and Bundle Discount) control the X and Y of the Bundle offer. Bundle Offer: This is what determines if the offer will be activated. You can set the quantity of how many products will be needed to meet the offer. You can choose both individual products, multiple products, individual collections, multiple collections, or a mix of each. Bundle Discount: After the Bundle Offer criteria have is met, the discount portion of the Bundle activates. For the offer, you’ll need to choose a type of discount that you’d like to offer which are, Exact Price, Subtract Price and % off. Buy 3 of product X and 2 of product Y and receive 50% off. Buy 1 from collection X, 3 from collection Y and 1 product Z for $10. The message section is where you’ll set how the notifications appear on your store. There are three main stages to the Bundle offer messages: initial message, progress message and success message. The initial message is what your customers will first see when viewing a product or collection that is attached to your Bundle. Appearing, unless customized, at the top of the page, the initial message informs your customers if the product or collection they’re viewing has any offers attached. Buy 1 from collection X and 3 from collection Y at 50% off! The success message is the third notification your customers will see. After your customer completes the criteria for the Bundle offer by adding the products to their cart, they’ll be presented with the success message. Offer: The Offer is the criteria that determine which products and collections will receive the selected discount. You can choose both individual products, multiple products, individual collections, multiple collections, or a mix of each. Choose discount: The Choose discount is where you'll select the discount type and discount quantity for the Offer products or collections. There are three types of discounts available: Exact Price, Subtract Price and % off. Discount product X by 50%. Discount collection X by $10. The Notification message is what your customers will first see when viewing a product or collection that is attached to your Discount offer. Appearing, unless customized, at the top of the page, the notification message informs your customers if the product or collection they’re viewing has any offers attached. Product X is currently 10% off while supplies last! Collection X and Product Y are $20 off today only! The success message is the third notification your customers will see. After your customer completes the criteria for the BOGO offer by adding the products to their cart, they’ll be presented with the success message. Congratulations! You've received product X and 15% off! Thank you for purchasing from collection X. This collection is $5 off today only! Overview: The Goal offer is ideal if you would like your customers to spend a particular amount on specific product or collections, and to then offer a discount on those products. To configure this offer, you will first set the Spend Goal dollar amount, choose the products or collections that it applies to, and then set the discount that your customer will be rewarded with on those products or collections. Name: First, give your offer a title (keeping “Goal” in the name may be a good idea so that you can easily search for it in the future). In the example below, we are calling this offer “GOAL - Skirt promo”. Step 1: Set the Spend Goal: Set a dollar amount (based on your store’s currency settings) that will be the minimum amount your customers will need to spend on the products or collections you choose in the next step. 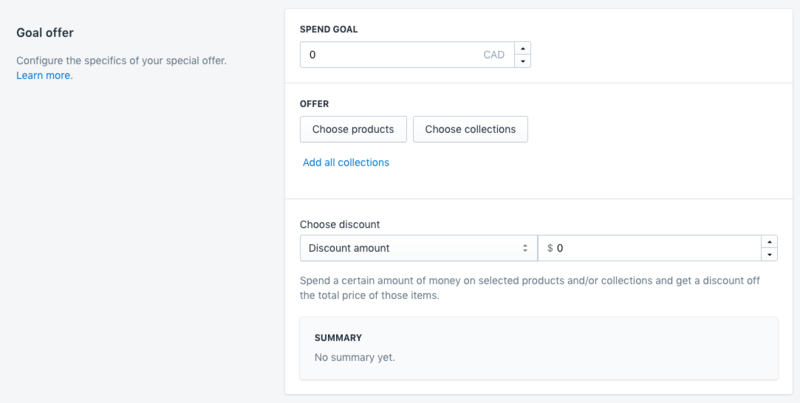 Step 2: Set Offer: You can decide to choose specific products or collections that the Spend Goal applies to, or you can select “Add all collections” in order to make the Spend Goal apply to all of your collections. Note: You can also choose specific products, even if they are not in the same collection, by clicking on “Choose products”. Step 3: Choose Discount: Finally, after setting the Spend Goal and choosing the products or collections you’d like to apply the Goal to, then you can decide what kind of discount the customer will be rewarded with. The discount amount will be automatically applied to the products in the cart. You can choose a percentage or dollar amount discount. Step 4: Goal Offer Message: This is where you will set the messages that appear on the announcement bar when a customer goes to the product page or the collection pages you set in the second step above. Initial Message: The initial message is what your customers will first see when viewing your chosen product or collections (Step 2). The initial message provides customers with details on your offer and can be placed at the top or bottom of your page. Example: This week only! Spend $200 on any skirt and receive 20% off! Progress Message: The progress message is what your customers will see when they haven't reached your Spend Goal yet. This message will tell them how much more they need to spend in order to qualify for the offer. Example: Spend another $48 on this collection to get a discount! Note: Do not set a dollar amount here. The monetary amount will be automatically calculated by the app. Success Message: The success message is what your customers will see after they've spent the required amount (or more! ), on your chosen products (or collections) that you set in Step 2. ⚠️ Note: if your theme uses a “sticky header” you may need to disable this in order for the announcement bar to appear, depending on your theme. You can do that by going to your Theme Editor. There are three main configuration options to set up a Gift offer. The first two, Spend Goal and Free Gift, control the criteria of the Gift offer and are detailed below. Spend Goal: The Spend Goal is the criteria that determine if the offer will be activated. You can set the amount required to be spent by the customer to meet the offer. Free Gift: After the Spend Goal criteria is met, the Free Gift portion of the offer activates. For the Free Gift, you’ll need to choose a type of free gift which can be either multiple products, individual products or products from collections. Spend $100 and receive product Y for free. Spend $50 and receive anything from collection Y for free. Below the Spend Goal and Free Gift, you'll have the option to decide whether or not you want to allow multiple free gifts. For example, if you have a Free Gift offer for $50 and the customer spends $200, they'll receive 4 of the selected Free Gifts. The initial message is what your customers will first see when viewing a product or collection. Appearing, unless customized, at the top of the page, the initial message informs your customers of any Free Offers that are active. Spend $100 and receive product X for free! Spend $200 and receive 4 products from collection X for free! The success message is the third notification your customers will see. After your customer completes the criteria for the Free Gift offer by spending a specific amount they’ll be presented with the success message. There are three main configuration options to set up an Upsell offer. Trigger: Thos the criteria that determine if the offer will be activated. You can set the product to purchase or the collection to purchase from that will trigger the offer. You can choose both individual products, multiple products, individual collections, multiple collections, or a mix of each. Promotion: After the trigger criteria have is met, the offer portion of the Upsell activates. 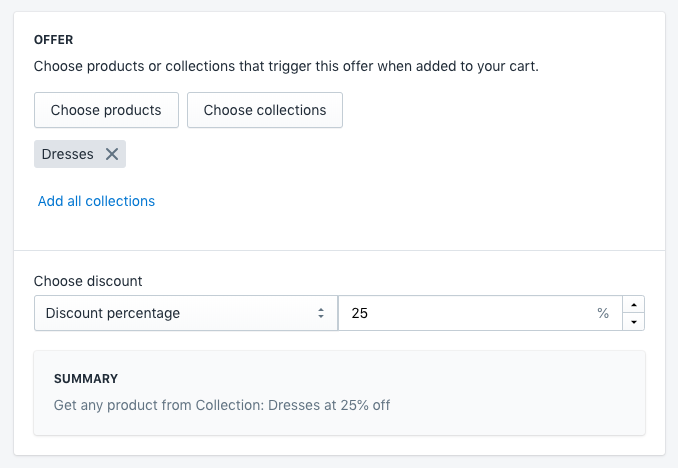 Similar to the trigger, you can select both individual products, multiple products, individual collections, multiple collections, or a mix of each. After the products or collections for the trigger and Promotion have been set, you’ll need to set the message portion of the offer. The Upsell message is what your customers will see when purchasing a product or collection that is attached to your Upsell offer. Appearing, unless customized, at the top of the page, the Upsell message informs your customers if the product or collection they’re viewing has any offers attached. Thanks for purchasing product X. You might also enjoy product Y! You've purchased from the X collection. Customers who purchase this frequently buy product Y. You've purchased product X from X collection. Check out collection Y for similar products! There are three main configuration options to set up a Volume offer. Details: The details are the first criteria that determine if the offer will be activated. You can set the product to purchase or the collection to purchase from that will trigger the offer. You can choose both individual products, multiple products, individual collections, multiple collections, or a mix of each. Price Tiers: This is the second criteria that determine the tiers of the Volume offer. You can set the quantity of how many products will be needed to meet each tier as well as the discount for each tier. There are three types of discount types available for Volume offers and are Per product variant, Per product and Per entire product selection. Per product variant: This discount type checks each variant of a product against the volume tiers. For example, if a customer purchases 4 different variants from 1 product, it will count as 3 for the volume tiers. Per product: This discount type checks products rather than variants against the volume tiers. For example, if a customer purchases 3 variants from product X and 2 variants from product Y, it will only count as 2 for the volume tiers. 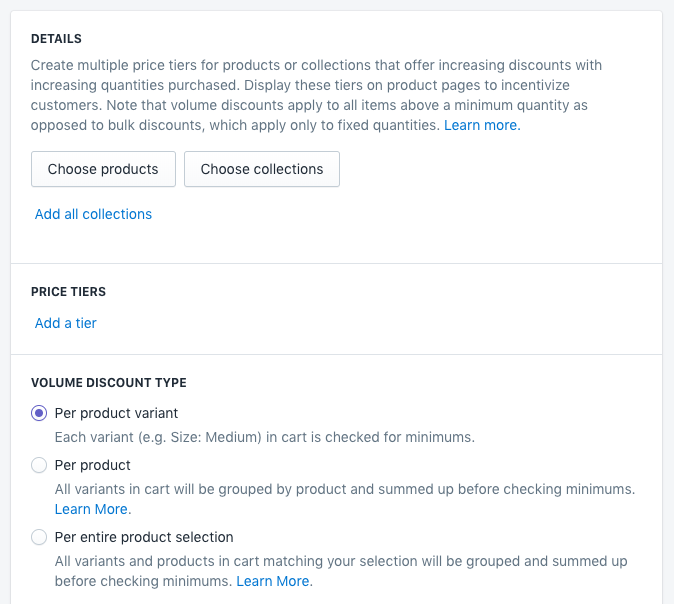 Per entire product selection: This discount type checks both products and variants against the volume tiers. For example, if a customer purchases 3 different variants from the same product and 2 additional products, it will count as 5 for the volume tiers. The message section is where you’ll set how the notifications appear on your store. The product page message is what your customers will first see when viewing a product or collection that is attached to your Volume offer. Appearing, unless customized, at the top of the page, the product page message informs your customers if the product or collection they’re viewing has any offers attached. Buy 1 more product X and receive an additional 10% off! Purchase 1 more product from collection X and receive 5% off. The cart line message is what your customers will see under each product while viewing their cart if there's an attached Volume offer. Buy 1 more to get an additional 20% off! You've purchased product X. Purchase 2 more to receive $5 off. The success message is the third notification your customers will see. After your customer completes the criteria for the Volume offer by adding the highest price tier to their cart, they’ll be presented with the success message. Each of the different offer types includes an "Availability" section that allows you to specify when the offer is available to your customers. Choose to offer it on the online store or POS (Point of Sale) system if you're using one, or both! You can select a start and end date for the offers if you'd like - if you don't select anything, the offer will be available immediately with no end date. Setting a date and time for your offer type will help free up your time to ensure that the planning has already been taken care of. This is a handy tool if you are planning for different holidays throughout the year (like Valentine's Day, Black Friday / Cyber Monday, etc.). It's also a great way to celebrate milestones for your business where you'd like to offer time-sensitive promotions to your customers. To get this set up, click on the "start date" field to choose your preferred start date for the offer, then in the "Time" field type in the time that the offer will start. For example, let's say that the fictional organization Molly's Boots is having an anniversary sale over the weekend of March 23rd 2019. They'll want to select March 23rd from the "Start date" field, and then type in 00:00 as the start time. The end of the sale would be March 24th at 23:59. If you have set up an offer to be active for a select period of time, and/or to a specific group of tagged customers, then be sure to spread the word about your offers to these customers through your snazzy email newsletters (check out our blog post on making great newsletter campaigns). Still have questions? We have your back — our amazing email support team is standing by six days a week to help! Get in touch with us here: https://www.pixelunion.net/contact .